The intense sociopolitical debate that has been taking place in Cuban society, and its clear ability to impact on insular public opinion, constitute irrefutable evidence that Cuba is alive. The vibrancy of the Caribbean nation, as evidenced in the recent discussions surrounding the Internet  [en] and the Migration Reform  [en], amongst many others, has been expressed through blogs and social media. 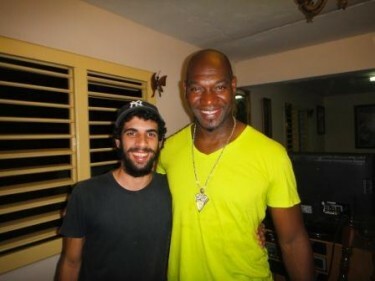 The arrival, just over a week ago, of José Ariel Contreras to Cuba, a Cuban baseball pitcher based in the US since 2002, has moved the inhabitants of his native province, Pinar del Río, and also fans of Cuba's national sport: baseball. Las últimas modificaciones de la Ley migratoria, que finalmente “pusieron” a mi primo en Miami y en Belice a mi mejor amigo, trajeron a José Ariel Contreras al Capitán San Luis. ¡Demasiado para el aburridísimo pueblito de Pinar que José Ariel, en el castellano que casi olvidara antes de “irse”, hubiese intercambiado con su pueblo!, cuenta desde su perfil en Facebook el periodista Carlos Díaz . The most recent modifications to the Migration Law, which finally “put” my cousin in Miami and my best friend in Belize, brought José Ariel Contreras to the stadium Capitán San Luis. So much for the boring town of Pinar, which José Ariel (in nearly forgetting his Castilian before leaving), had exchanged for his new town!, recalls the journalist Carlos Díaz from his Facebook account . Only recently this was merely a dream, now finally it has become reality… In the same way that René Arocha broke the ice and left, José Ariel Contreras has become the first Cuban baseball player to return to the Island… I hope that following this, many more will come and with no shortage of wishes to set foot on Cuban soil and squeeze into their number four shirts. Carlos Manuel Álvarez, a journalism student and blogger, who carried out the interview with Contreras , joined the celebrations. Álvarez travelled to Las Martinas- Contreras birthplace- late on the 30th January in order to ask him about his experience of Cuba more than 10 years later, along with other questions, which the sportsman was happy to answer. According to Álvarez, Contreras’ exit from the national selection during 2002 caused a great shock. “Many players had split beforehand, but Contreras stayed a while. Your return has created a way back in, in some respects it has built a bridge. Can you imagine those baseball players who left, playing once again for Cuba?”, he enquired. First of all we are Cubans, regardless of where we are or whatever we are doing. Be it playing baseball, or sweeping a street in any place in the world, we continue being Cuban. In fact, I signed a clause in 2002 with the Yankees that states that I won't play against Cuba. If I play in an international event, I will play with my team. This is my dream, to have the opportunity to play for Cuba before I retire. Throughout this month, Cuba has also reformed the programming of state television channels. As part of these changes, it was announced that a weekly transmission of baseball games from professional foreign leagues would be shown, satisfying the long-standing demand of the people, that could make possible the dream of watching the New York Yankees on screen. The professionalisation of baseball is another pending matter for sports in Cuba. According to Contreras , “the best baseball in the world is in the US, but the Japanese, Korean, Domincans and Venezuelas all play there. The Cubans will also have to join and the quality will rise, indisputably”. For the readers of OnCuba , the magazine that got the scoop on the interview, it is important that “the Cuban baseball players can get involved in the major leagues, and that Contreras’ dream of playing for Cuba in the World and Classic Leagues may come true”.